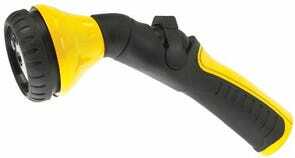 This one is listed as Yardsmith 4 In. Metal Twist Nozzle with Overmold. They last several summers of desert heat and grime, and even when they lose some of their ... (checks product description) “overmold”, they still work fine. Eight bucks. There are smaller, and there are more expensive twist nozzles, but I’ve found this style to be the most resilient to desert conditions. When dust or grit gets stuck inside, you can just flush it out with a twist or two. That’s not the case for others I’ve tried, because they’re made to finer tolerances and expect to be kept pristine, away from all that dirt and messy gardening things. 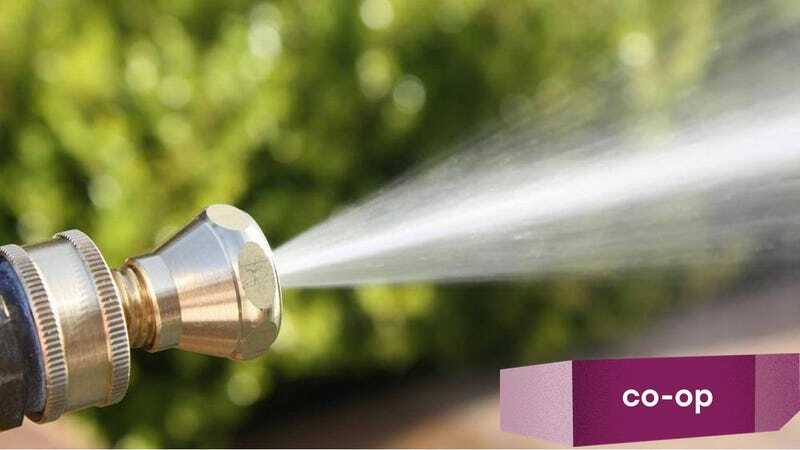 The one pictured above isn’t like those Garden Queens; it’s a working-class nozzle. It doesn’t mind a bit of hard work. It’ll go from a full-on firehose chug, down to a fine, conical, child-cooling mist. Thing is, you have to change the spray pattern to switch it off. So then I add a grip valve. Again, very generic. Again, very robust in desert heat. 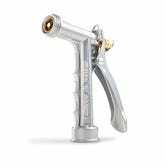 It’s the famous Yardsmith Classic Metal Pistol Nozzle, $6.18. Sure, you can feel the 120°F water through the steel handle at first, but if you’d just wait it gets cooler. If it bothers you that much you could use a couple of rags to cover the grip and lever. You can’t use this on its own (although I’ve seen people try) because it has no focus and no control. The one that’s cheapest at your local hardware store. I dug for ages looking for a nice stainless steel or solid brass old school version and ran across the below. Built like a tank and works damn good.